Using LiveChat and Wunderlist daily? Good, if you find those two useful you can marry them up. 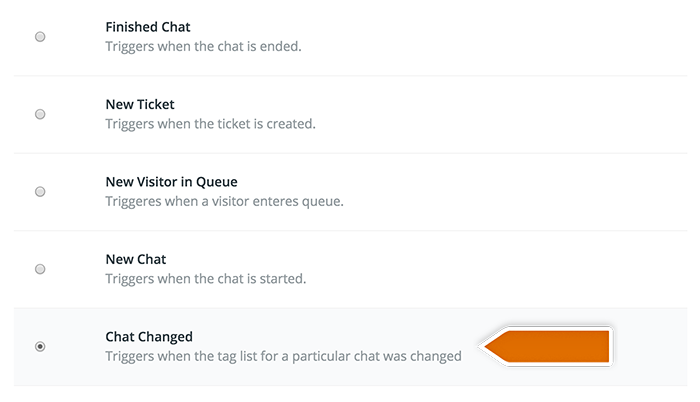 If your chat visitors give you inspirational ideas about your webpage, have queries about their purchases (on which you need to check later) or report errors via LiveChat then you can create a tag for such chats and add them to tasks on Wunderlist to-do. Here’s a tutorial with instructions on how to create a Zap that will add a task to your to-do list in your Wunderlist after a ‘note’ tag is added to a chat. The first step to set up this integration is to determine a condition that will trigger an action in your Wunderlist account. In this integration Chat changed trigger will be used. Select Chat changed as the Trigger. Select Connect a New Account and then provide your LiveChat login email and the API key. Next, click on Yes, continue to accept. You can rename your account. Then confirm your choice by clicking on Save + Continue. The second step is adding a filter that will only pass the chats with a ‘note’ tag further. 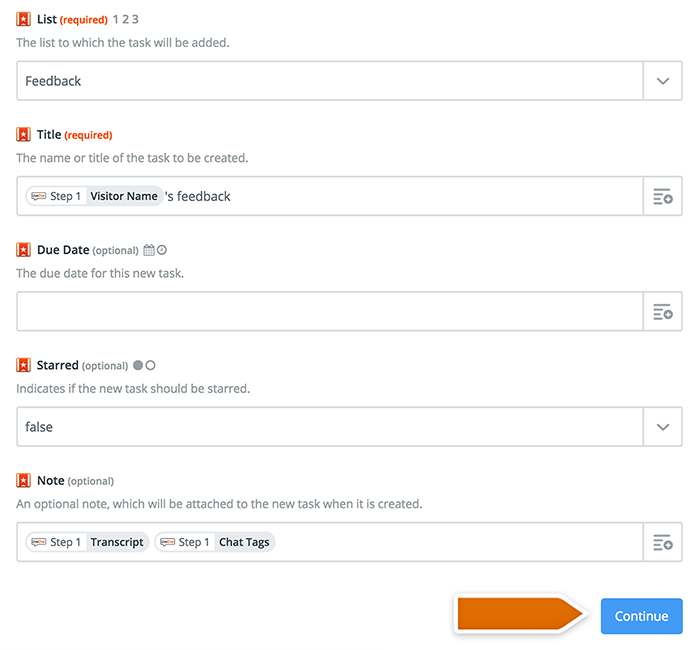 Go to the filter section in Zapier and choose the tag of the chats that you want to pass to Wunderlist. Then confirm by clicking Continue button. High time to configure what will happen in Wunderlist after the tag is added to a chat. Choose Wunderlist as Action App. Then choose Create Task as the action and confirm by clicking on Continue. 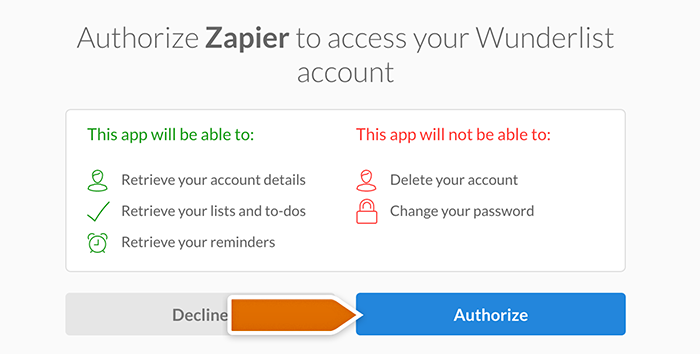 Select your Wunderlist account and confirm the choice by clicking on Continue. 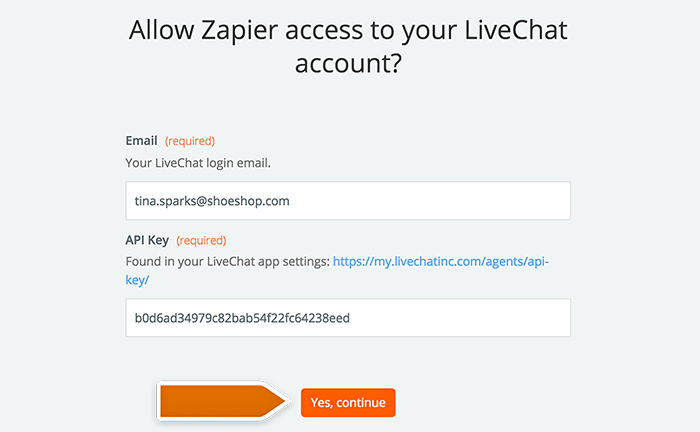 Authorize Zapier’s access by clicking Authorize in the pop-up window. Next, decide which data will be passed in your Task. Zapier will ask you to test the Zap. Follow the instructions to make sure your Zap is working correctly. Ready to go live? Time to turn this integration on then. Turn the Zap on by clicking on the grey switch and start passing information from LiveChat to Wunderlist. Congratulations! You have just linked your LiveChat with Wunderlist through Zapier. From now on, transcript of each chat with a ‘note’ tag will be passed as a new task.